If you don’t got Urban Decay “Naked” Eyeshadows! These eyeshadows are a MUST HAVE in any Beauty Guru’s collection because they’re so versatile! This will help you transform your eyes from Day to Night with just one pallet! This is why it’s my FRIDAY FAVORITE! Ever since I received it in the mail I have been wearing it everyday! I’m in love with the “Virgin” Highlight shadow that’s on the far left because it brightens my eyes without it being “white & creamy”. This color is perfectly pigmented and all you need to do is add a dab to your outer corner of your tear ducts and it opens and adds lights to make you look fresh and awake! Another color I use often is “Half Baked” that has the right amount of shimmer and gold! 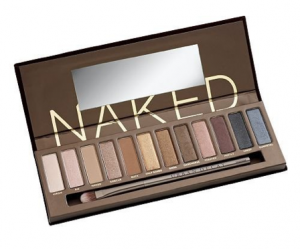 Make-up Lovers have raved and craved this Urban Decay Naked Pallette so much they have created a Naked 2 with more colors!!! It’s perfect for achieving neutral, smokey, dramatic, or pretty much any look. The palette comes with 12 shades including 5 new shades, a shadow and crease brush, and it’s great for traveling! LADIES LISTEN UP!!! I’m going to be doing another FUN FREE GIVEAWAY because I just adore and LOVE you guys all so much!!! Who doesn’t want FREE MAKE-UP! RAFFLE CONTEST ENDS SUNDAY MAY 13, 2012 ON MOTHER’S DAY! Contest winner + MORE GIVEAWAY! / OOTD! THANK YOU TO ALL MY VIEWERS!!! Congrats to “Ba Xa” for winning the Benefit – BAD girl Lashes Mascara! I’m giving away a box of 10 FREE FALSE EYELASHES! The first 10 people who comment -ON MY BLOG- (make me laugh, send request for my next videos, or ask for a shoutout); I will choose 1 special winner!! Good Luck! There will be more GIVEAWAY so keep checking back!